A wireless intervalometer the unit at the left can also be wired to the camera directly. You may have noticed that I mention an intervalometer in many of my images. It is an essential tool for making unattended shooting much easier. Let me take a few paragraphs to explain what an intervalometer is, how it works, and provide some examples – and reviews – of different options. An intervalometer is an unnecessarily long word for a timer. A sesquipedalian, if you will. Using a timer is a step up from a remote release cord also sometimes called a cable release. A remote release is a device for activating the shutter without having to touch the camera. Any touch while exposing can cause unwanted movement and motion blur. The phrase cable release comes from the old days when pressing the shutter button was a mechanical process and literally required a button and cable system similar to the accelerator in your car. Nowadays mechanical systems are rare. The cable release is often called different things just to confuse people. 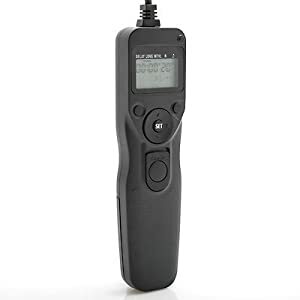 It may be called a Remote Release a Remote Cord a Shutter Release Cord a Remote Shutter Release Cord and more. Despite the presence of the word remote very few units are actually wireless. A remote release cord is very handy for preventing camera shake. Nearly every model I have seen has a nice little feature where the shutter button can be locked down for a long exposure. You DEFINITELY do not want to be holding the shutter button down for a 10 minute exposure. You will get the shakes, your arm and finger will grow numb and your image will suffer. The very act of pressing the shutter button is enough to start the camera moving and thus blurring your image. If you are going to take star trail images you need AT LEAST a remote release. Which one? Unfortunately I can not answer that question since every manufacturer has different connections for their cameras. Canon has two different connectors for its DSLR cameras, Nikon has 3! A release for a Canon Ti Rebel will not fit a Canon 50D. Sadly some Nikon cameras do not even have a remote release connector. Some intervalometers also have indicator lights, display lights and beepers to help you keep up with what they are doing. How you actually configure any given timer differs from brand to brand and style of remote. For star trail work, you want an intervalometer that fits your camera model and has all of the features above. 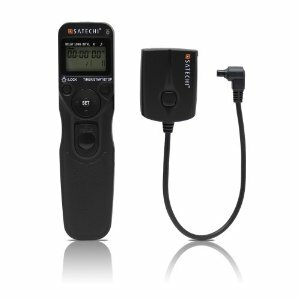 Opteka Timer Remote Control with N3 connector for Canon EOS 1D, 7D, 5D, 20D, 30D, 40D, 50D. Might be out of stock or discontinued. This particular remote – was out of stock at Amazon when I checked. The remote- has been my workhorse for almost three years. You can read my review of it on Amazon or Epinions. A similar (and slightly cheaper model) is the “Shoot” brand. You can also compare with reviews of three other models: the Satechi TR-A, the Jenis Wireless, and the Canon TC-80n3 all of which I have used. The TR-A uses a CR2032 coin battery which gave out on the first attempt to use it. The Jenis wireless remote – which seemed like a great idea just doesn’t work. Though there is a Satechi wireless model that is brilliant at about $60 USD. If you do not want to plunk down money for a cheap intervalometer, there is a more expensive solution – at least for Canon. You can use the “EOS Utility” with a laptop connected via a USB cable to control the camera. Of course with that method you now also need to carry an additional cable, laptop and source of power. And if you’re ultra cheap, you can use a rubber band over the shutter button and set your camera in continuous exposure mode. Turn off high speed or continuous exposure. Turn off any delay timer. If you are using a delay before the exposures begin, you may need to use a “Custom” (C1, C2) setting. When the camera wakes from automatically powering down it may return to the default settings rather than the most recent settings. Using “C1” on Canons allows you to set all the exposure options so that the camera will return to the settings you want even if the camera remains powered off for hours before exposures start. One more important point: when you set your intervalometer you will have to leave at least a one second gap between exposures. For Canon, you may need to have a 3 second gap between exposures. Why? See “How Long is a 30 Second Exposure“. This entry was posted in Gear, Intervalometer, Photo Tip, Review and tagged apparatus, automation, cable release, gaps in trails, gear, intervalometer, remote release, review, Star Trails, timer on September 7, 2010 by Steven Christenson. Note: The Canon 5D Mark II will tolerate a 1 second gap between exposures controlled by a remote timer. Addendum: There are at least two kinds of intervalometers. A type A intervalometer expects the “interval” to be the total time between the beginning of one shot and the beginning of the next. This makes perfect sense if you know you want to shoot one frame every 4 minutes. The other approach manufacturers have taken, type B, is that the “interval” is in fact the non-shooting time between shots. For a type B intervalometer you know you want to take one 10-second exposure every 4 minutes you must set the “duration” of the shot to 10 seconds and the interval to 3 minutes, 50 seconds. With the second type, programming star trails is relatively easy. You set the interval to 3 or fewer seconds (why 3? See here), and set the duration to whatever you like, for example 4 minutes. Because my mind likes order, I usually program this style of intervalometer by setting the duration to 3 minutes, 59 seconds and the interval to 1 second giving me a shot that begins every 4 minutes. With the former type – I do something similar: I set the interval to 4 minutes and the shot duration to 3 minutes, 39 seconds. Read your manually carefully to determine what kind of intervalometer you have and try to make sense of the terminology they use. What I have called duration above is called “LONG” on two of my intervalometers. Oh, and beware, because many devices have odd behaviors. For example you usually cannot set a 4 minute duration and a 0 second interval – 1 second is the minimum. On a type A device setting an interval that is equal to or shorter than the shot duration also doesn’t work and the intervalometer may behave differently if you set the “number” of shots to 0 (usually means continue shooting forever).